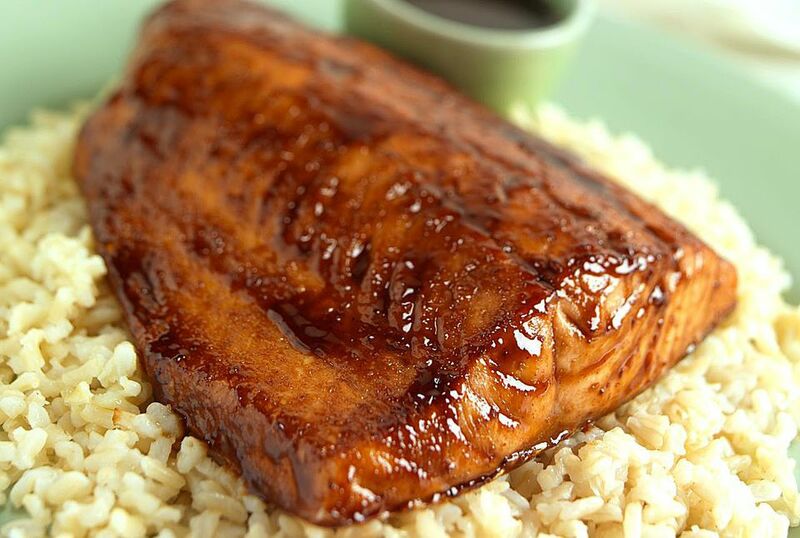 This baked salmon comes out beautifully; the marinade is a simple mixture of Asian sauces and fresh spices that come out tasting similar to teriyaki, though it is essentially Chinese-Thai in origin. You can balance out the sweet-sour flavors to your liking just before serving, so you know you'll be happy with the results. Briefly rinse salmon fillets or steaks under cool water. Shake off excess or pat dry and place pieces in a flat-bottomed baking dish (you will need a lid or foil to cover it). In a separate bowl or container, combine the hoisin sauce, soy sauce, lime juice, honey, and chili flakes. Stir well to dissolve the honey. Add garlic and white parts of the green onion (save the green parts for serving). Pour over salmon, turning pieces to saturate. Cover and allow to marinate in your refrigerator 30 minutes or up to 2 hours. When getting close to your desired cooking time, preheat oven to 350 F.
Spoon a little more sauce over each piece, then recover and bake at 350 F for 20 minutes, or until sauce is lightly bubbling and inner flesh of salmon has turned from translucent to opaque. If undercooked, cover and return salmon to oven for another 5 to 10 minutes. Remove from oven and taste-test the sauce, looking for the following flavors: sweet followed by sour, then spicy. If too sweet or too salty for your taste, add a few more squeezes of lime juice. If not sweet enough, add a little more honey. More chili can also be added. Serve salmon with some of the sauce spooned over each piece, topping with a sprinkling of the reserved green onion.